We're in the process of converting our laundry room into an office. 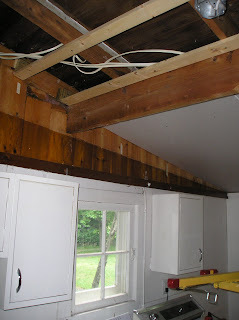 Last year we removed the old ugly drop ceiling and put in a drywall ceiling. This was tough, especially because the new ceiling is not flat, there were lots of wires and cables to deal with, and there isn't a true right angle anywhere in the room, but it looks so much better now. Then we had the whole room insulated. It had been a porch at one time, so it was never properly insulated, and we've been having the whole house redone anyway. Sorry I don't have a true "before" picture, but here you can see the ceiling in progress. Also the old steel cabinets above the old washer and dryer. Next we had the sink, washer and dryer moved to the other side of the room, where they can be hidden behind doors, pulled off the old pressboard walls and patched up the paneling. Turns out the paneling is quality vintage stuff, so we decided to keep it for the character. Then we got a new, stackable washer and dryer set. Yay! Next put up drywall and installed a new floor. It really is starting to look like a real room, isn't it?